In Omaha, fall is the perfect time to inspect your home and look for areas that may need some attention. We recommend power washing your home twice a year. In the spring and in the fall. After you have washed your home in the fall, look at areas that may need some touch up like window sills, around doors, around faucets, etc. Look for cracking or peeling paint and pay special attention to areas that may need to be re-caulked as well. Exterior paint touch ups can sometimes be a challenge. The biggest issue is with paint that may have aged or faded over time. In situations where this has occurred, having some leftover or extra paint isn’t going to be much help. 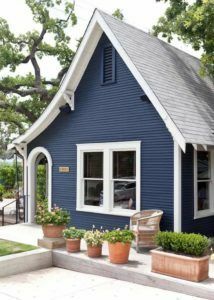 The best approach in this situation is to match the existing paint on your home and use that instead. To get something to match, look for a gutter strap, outlet cover, downspout, etc. Take your “sample” to the paint store and have it matched in the same product that was used to paint your home. Touching up is not too difficult. Once you have the paint you need, either leftover or newly matched, you will want to scrape and sand the area and then do any caulking that may need to be done. 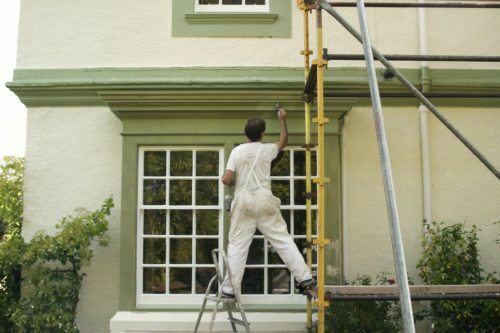 Prime the area with a quality exterior primer. I like Sealgrip. When touching up it is a good idea to paint to a stopping point or to paint an entire area rather then just a specific spot. For example, paint the full window sill or paint the full piece of lap siding. This will help to blend the touched up area to the rest of the home. Always do two coats!